In 1893, New York architect Bruce Price, designer of the Chateau Frontenac in Quebec City, designed The Turrets, a Bar Harbor retreat for John J. Emery. No stranger to Mount Desert Island, Price designed three other private cottages on the island, as well as the annex for its West End Hotel. The Turrets, however, is the only remaining Bruce Price building on MDI, and an important Maine example of cottage-era architecture. Construction of this massive summer cottage cost $100,000. It took two years to complete, with all the exterior granite cut near Eagle Lake on Mount Desert. College of the Atlantic purchased the property in 1973, and two years later the building was listed on the National Register of Historic Places. The college initiated a restoration in 1977 with the aid of grants and private gifts. The building was dedicated in 1982 to the John Joseph Emery family of Hulls Cove, Maine, descendants of The Turrets’ original owners in recognition of their interest in and support of that Turrets restoration project. In 1987 and 1989 the college received matching funds from the Maine Historic Preservation Commission to complete the restoration of The Turrets to its original condition. By the early 2000s, The Turrets suffered from serious deferred maintenance issues. This led to safety concerns as the slate roof and granite facing deteriorated. Rob Shea of E.L. Shea Builders and Engineers conducted a courtesy inspection of the ocean-side turrets and reported that both were in extreme danger of falling off the building. A “bare bones” plan and budget were developed to address the most critical systems. Building Envelope Specialists, Inc. (BES) was retained to provide plans for repairing the granite sides and chimneys, as well as updating roofing information in case money became available to implement more than a stop gap measure. In 2012, following extensive campus discussion, College of the Atlantic reached the decision that they wished to continue to use the building year round. President Darron Collins and the Board of Trustees committed to fund the entire envelope package at $3.7 million. 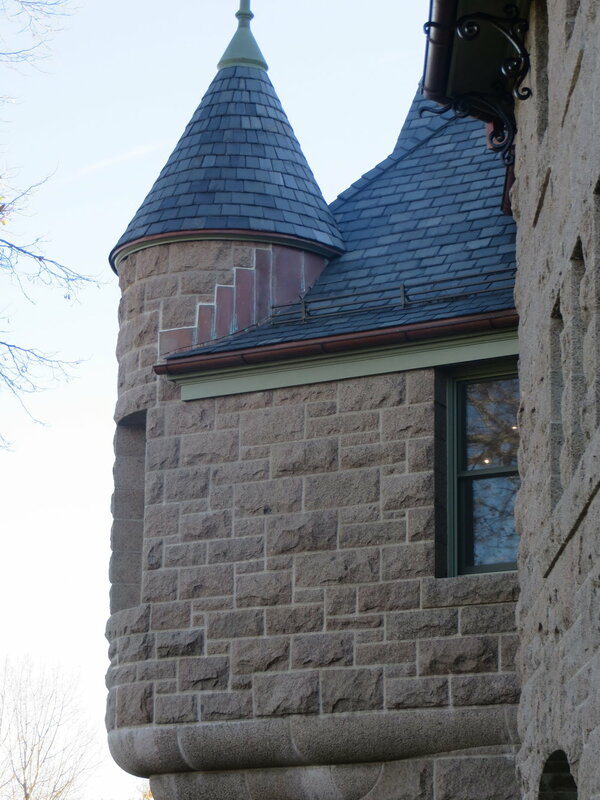 Restoration at The Turrets focused on three critical building components: masonry, roof, and windows. The masonry work by Joseph Gnazzo Company included a comprehensive repair of the building’s granite masonry façade. Hahnel Brothers took painstaking care to install a new slate roof that matched the historic Monson slate roof, with new copper flashing added. And, finally, E.L. Shea installed a combination of original windows meticulously restored, and where necessary, new historically accurate windows. Currently, The Turrets provides both academic and administrative office space for College of the Atlantic. Each day, approximately 250 staff and students of the college access and use the Turrets. The Turrets is one of Maine's historic and architectural treasures. The College of the Atlantic community’s commitment to preserve the structure has resulted in a beautiful and functional building, which is the centerpiece of the college’s campus. In recognition of this extraordinary dedication, Maine Preservation is pleased to present College of the Atlantic and the Turrets project team with a 2014 Honor Award for Rehabilitation.